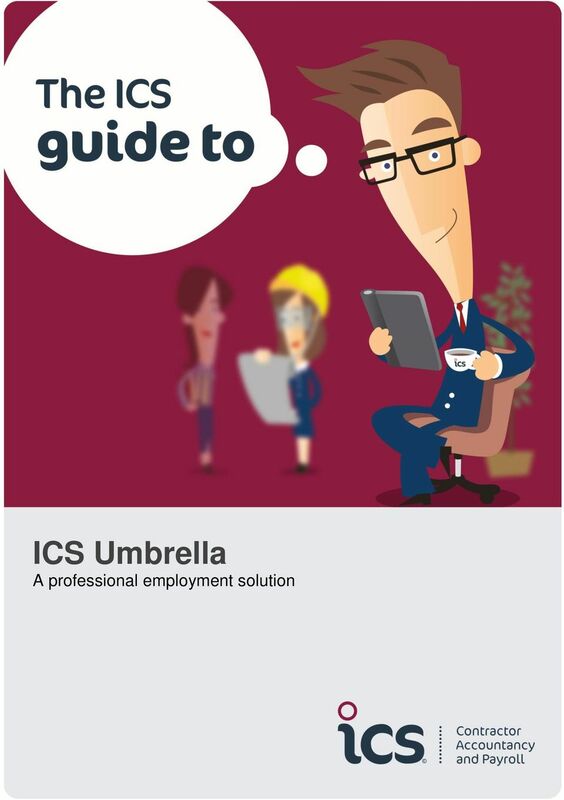 Download "ICS Umbrella A professional employment solution"
4 Frequently asked questions Below are the most frequent questions we are asked. If you have any additional questions or require any other help or guidance please do call us free on or What is an umbrella company? An umbrella company engages employees by way of an umbrella contract of employment. This is an over-arching contract of employment which provides continuous employment to an employee whether they are working on assignment with a client or not. ICS Umbrella provides a complete and professional employment service for contractors. Our aim is to remove the burden of administration by providing useful services at every stage of your working life. Our dedicated team of experts will process your timesheets and expenses; invoice the client or agency and chase late payments; as your employer we ll take care of your PAYE and National Insurance obligations; and transfer payments to your personal bank account on the same day we receive them. We offer a personal service, and your Account Manager will be available if you need help or advice. We offer comprehensive Professional Indemnity, Public and Employers Liability Insurance for complete peace of mind. We will also provide financial advice, and references for mortgages if required. ICS Umbrella is fully compliant with all government regulations and legislation, including IR35. How do I get started? Our registration process is simple and can be done electronically, or by telephone. We require the following information, either by fax, post or scanned and attached to an A completed ICS Umbrella Personal Details form A copy of the photo pages of your passport or your photo driver s licence A copy of a valid work visa/permit (if applicable) A P45 from your last employer or a P46 Upon receipt we will contact your agency or client and request that your contract is issued to ICS Umbrella Ltd. Please note that a copy of the contract will be sent to you for review before we sign it on your behalf. 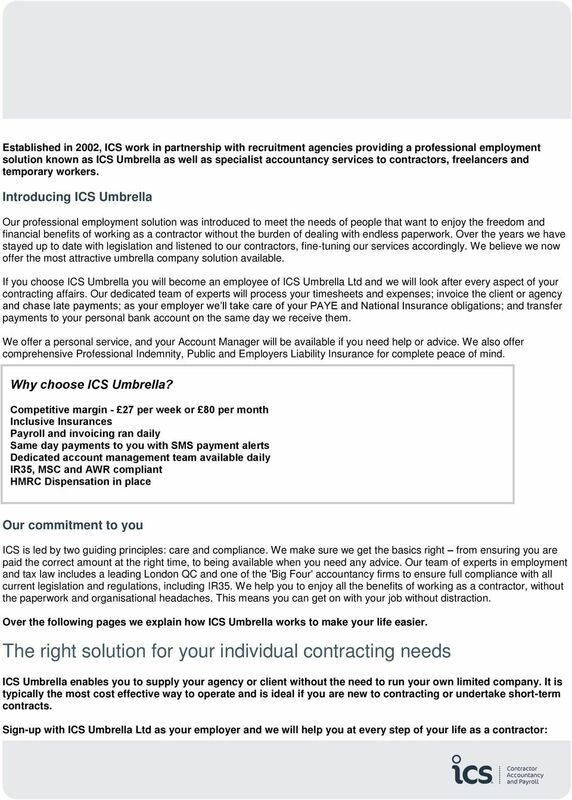 You will then receive a Contract of Employment with ICS Umbrella Ltd, which you will need to sign and return. What happens at the end of my current contract? 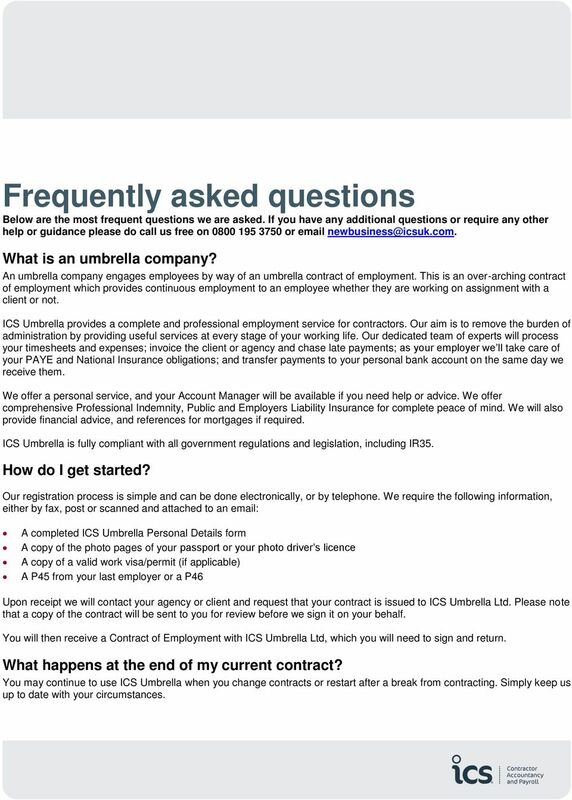 You may continue to use ICS Umbrella when you change contracts or restart after a break from contracting. Simply keep us up to date with your circumstances. 5 How do I submit my expenses and timesheets? It is important to record time spent on assignments on the timesheets provided by the agency or client. 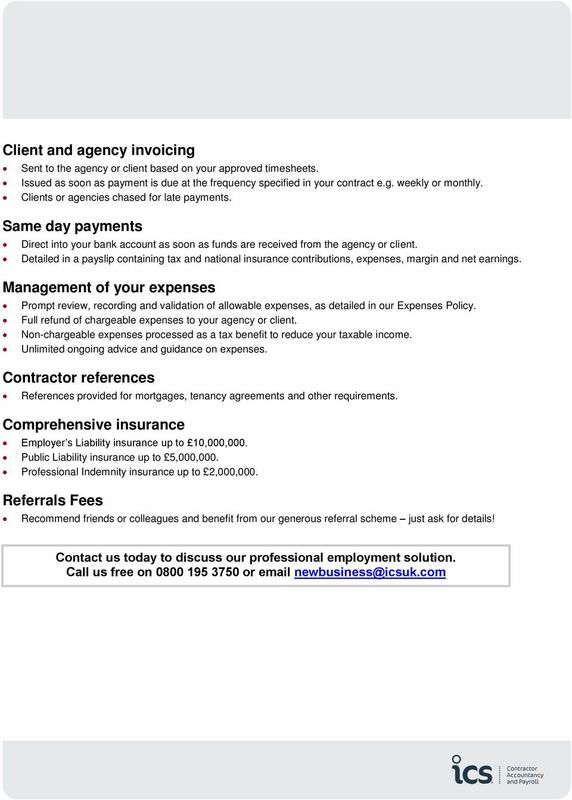 Expense claims which are chargeable to your agency or client are usually completed following their own processes. It is your responsibility to ensure that your timesheets and expense claims are approved and submitted according to the processes outlined in your contract. 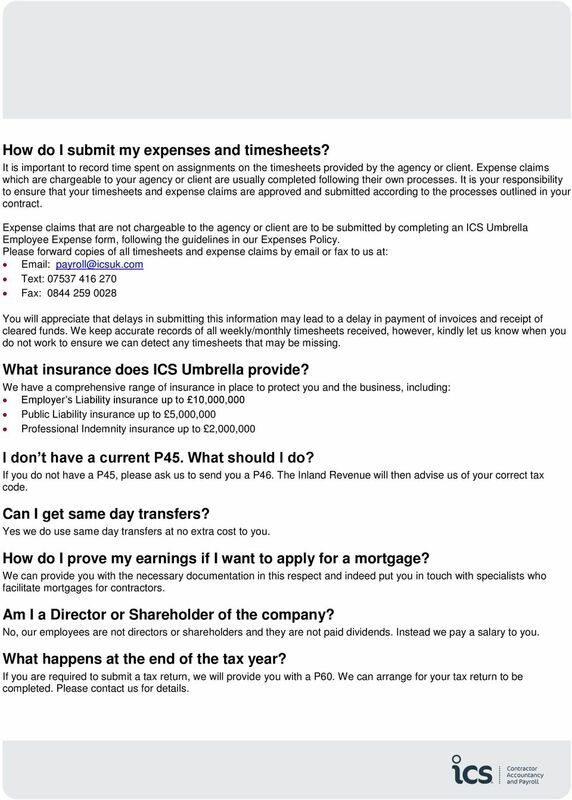 Expense claims that are not chargeable to the agency or client are to be submitted by completing an ICS Umbrella Employee Expense form, following the guidelines in our Expenses Policy. Please forward copies of all timesheets and expense claims by or fax to us at: Text: Fax: You will appreciate that delays in submitting this information may lead to a delay in payment of invoices and receipt of cleared funds. We keep accurate records of all weekly/monthly timesheets received, however, kindly let us know when you do not work to ensure we can detect any timesheets that may be missing. What insurance does ICS Umbrella provide? We have a comprehensive range of insurance in place to protect you and the business, including: Employer s Liability insurance up to 10,000,000 Public Liability insurance up to 5,000,000 Professional Indemnity insurance up to 2,000,000 I don t have a current P45. What should I do? If you do not have a P45, please ask us to send you a P46. The Inland Revenue will then advise us of your correct tax code. Can I get same day transfers? Yes we do use same day transfers at no extra cost to you. How do I prove my earnings if I want to apply for a mortgage? We can provide you with the necessary documentation in this respect and indeed put you in touch with specialists who facilitate mortgages for contractors. Am I a Director or Shareholder of the company? No, our employees are not directors or shareholders and they are not paid dividends. Instead we pay a salary to you. What happens at the end of the tax year? If you are required to submit a tax return, we will provide you with a P60. We can arrange for your tax return to be completed. Please contact us for details. 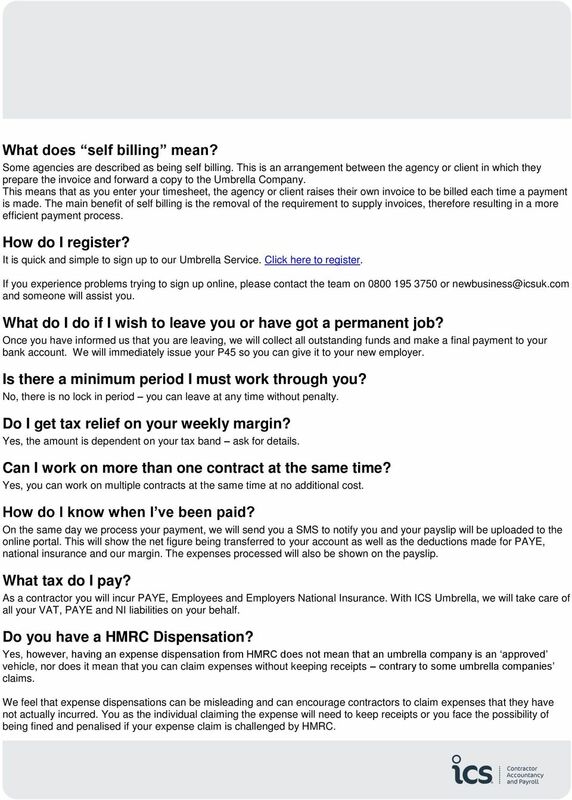 6 What does self billing mean? Some agencies are described as being self billing. This is an arrangement between the agency or client in which they prepare the invoice and forward a copy to the Umbrella Company. This means that as you enter your timesheet, the agency or client raises their own invoice to be billed each time a payment is made. The main benefit of self billing is the removal of the requirement to supply invoices, therefore resulting in a more efficient payment process. How do I register? It is quick and simple to sign up to our Umbrella Service. Click here to register. If you experience problems trying to sign up online, please contact the team on or and someone will assist you. What do I do if I wish to leave you or have got a permanent job? Once you have informed us that you are leaving, we will collect all outstanding funds and make a final payment to your bank account. We will immediately issue your P45 so you can give it to your new employer. Is there a minimum period I must work through you? No, there is no lock in period you can leave at any time without penalty. Do I get tax relief on your weekly margin? Yes, the amount is dependent on your tax band ask for details. Can I work on more than one contract at the same time? Yes, you can work on multiple contracts at the same time at no additional cost. How do I know when I ve been paid? On the same day we process your payment, we will send you a SMS to notify you and your payslip will be uploaded to the online portal. This will show the net figure being transferred to your account as well as the deductions made for PAYE, national insurance and our margin. The expenses processed will also be shown on the payslip. What tax do I pay? As a contractor you will incur PAYE, Employees and Employers National Insurance. With ICS Umbrella, we will take care of all your VAT, PAYE and NI liabilities on your behalf. Do you have a HMRC Dispensation? Yes, however, having an expense dispensation from HMRC does not mean that an umbrella company is an approved vehicle, nor does it mean that you can claim expenses without keeping receipts contrary to some umbrella companies claims. We feel that expense dispensations can be misleading and can encourage contractors to claim expenses that they have not actually incurred. You as the individual claiming the expense will need to keep receipts or you face the possibility of being fined and penalised if your expense claim is challenged by HMRC. 7 Will I need to keep receipts? Yes, it is very important that you keep receipts for any expenses that you claim, including fuel receipts for mileage and for any subsistence during the day. If we do not have copies of your receipts we will be unable to process the expenses. If you are found to have claimed expenses that don t have a corresponding receipt, you will be penalised by HMRC for doing so and will have to repay your tax underpayment, as well as any additional penalties HMRC may impose. Is there a limit to what I can claim each week? No, however, it is best not to store up receipts but put in your claims regularly. If we cannot pay all your expenses in one week, we will carry over any outstanding to the following week. Unfortunately we cannot carry outstanding expenses from one tax year to the next but you can claim these directly from HMRC at the end of the year. We will provide you with a statement of expenses for that purpose. 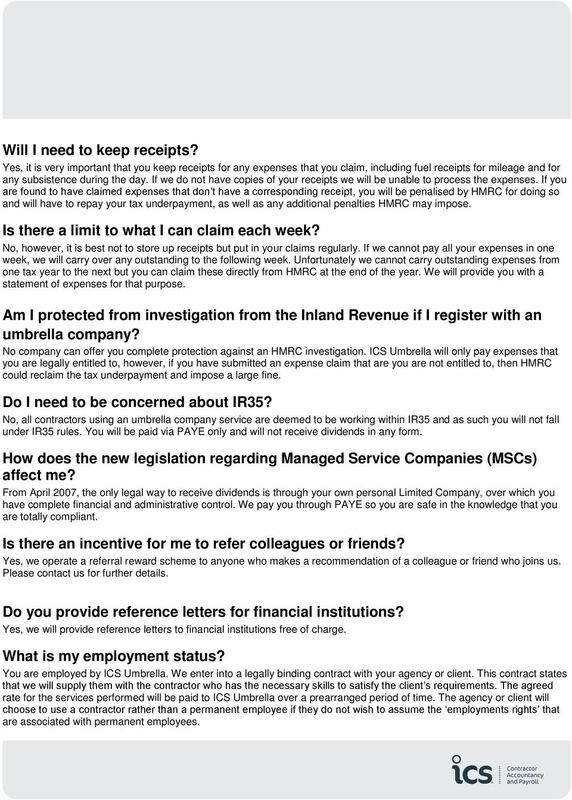 Am I protected from investigation from the Inland Revenue if I register with an umbrella company? No company can offer you complete protection against an HMRC investigation. ICS Umbrella will only pay expenses that you are legally entitled to, however, if you have submitted an expense claim that are you are not entitled to, then HMRC could reclaim the tax underpayment and impose a large fine. Do I need to be concerned about IR35? No, all contractors using an umbrella company service are deemed to be working within IR35 and as such you will not fall under IR35 rules. You will be paid via PAYE only and will not receive dividends in any form. How does the new legislation regarding Managed Service Companies (MSCs) affect me? From April 2007, the only legal way to receive dividends is through your own personal Limited Company, over which you have complete financial and administrative control. We pay you through PAYE so you are safe in the knowledge that you are totally compliant. Is there an incentive for me to refer colleagues or friends? Yes, we operate a referral reward scheme to anyone who makes a recommendation of a colleague or friend who joins us. Please contact us for further details. Do you provide reference letters for financial institutions? Yes, we will provide reference letters to financial institutions free of charge. What is my employment status? You are employed by ICS Umbrella. We enter into a legally binding contract with your agency or client. This contract states that we will supply them with the contractor who has the necessary skills to satisfy the client s requirements. The agreed rate for the services performed will be paid to ICS Umbrella over a prearranged period of time. The agency or client will choose to use a contractor rather than a permanent employee if they do not wish to assume the employments rights that are associated with permanent employees. SPECIALISING IN CONTRACTING SERVICES FOR CIS OPERATIVES. TAX & LEGAL COMPLIANCE. CONTRACTING. The Ultimate Guide. The things you always wanted to know but were afraid to ask.